Hackney, England - Opponenets to the Broadway Market gentrification plans have illegally re-occupied Francesca's café which they were foricibly evicted from just prior to the Christmas holiday. 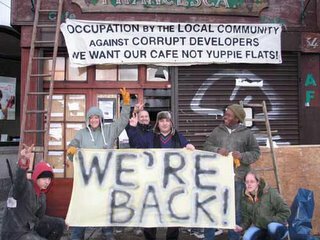 The squatters entered the building on Boxing Day (December 26th) and have since rebuilt the roof and walls that workers demolished after the eviction. Arthur Shutter a spokesperson for the group said that "developers are tearing the community apart, but we will fight them all the way."